The Lamson Cash Conveyance System focuses on the store owners' desire to have the very best in equipment in the newly constructed Up-To-Date Store. An agent for the Lamson System was first appointed in Australia in 1889. 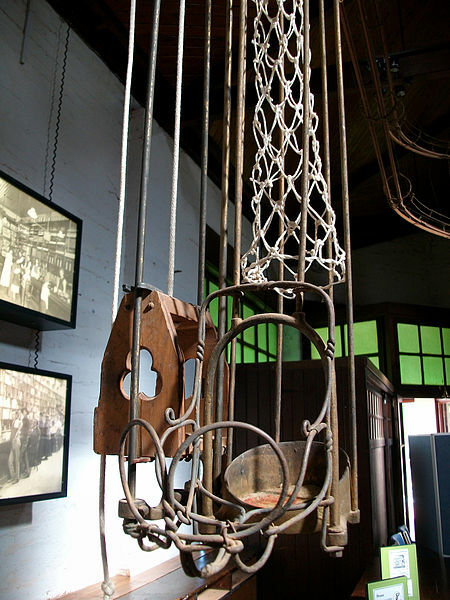 The installation of the system in the Store in the early 1900s, demonstrated the proprietors wish to be ‘most up-to-date’ in retail technology. Designed to solve the 'problem of women being less numerate than men’ not only did the Lamson Cash Conveyance System provide the store personnel with the very latest advances in retail technology, but also provided the assurance of `customer care' to the Coolamon community, with this quick and efficient method of cash handling. Undoubtedly, the Store’s piece de resistance, this earlier form of cash carrier is gravity operated. Timber balls with money and docket safely tucked inside roll from counters to cashier’s office along little ‘railway’ tracks. Many of us have seen the spring-loaded “flying fox” cash conveyance systems and modern pneumatic tubes are commonplace in large shopping stores and hospitals around Australia, but the Coolamon community claims that this is: ‘the only known in-situ Lamson Cash Carrier System of its kind IN THE WORLD’. Reg Godde was born at Coolamon, he farmed the property ‘Hazeleigh’ at Berry Jerry. Reg Godde constructed his first model, a steam engine in about 1948 and subsequently went on to build the remainder of the collection through the 1970’s and 1980’s. Each of the models have been scratch built using parts manufactured by Reg or from recycled materials. Reg Godde built this collection without plans, photographs or drawings of any sort. Reg Godde built all of the items on display, including the steam traction engine, oil engine, twin cylinder stationary steam engine, the HV McKay ‘Sunshine’ reaper and binder and a complete chaffcutter. He did not only focus on constructing models of farm machinery and also constructed a working Ferris Wheel and merry-go-round. Models such as his immensely complex steam driven chaffcutter which actually cuts and bags the chaff in exactly the same manner as the larger version of the machine it was based on. The only concession made by Reg was to convert the models to allow them to be driven by compressed air or electricity, rather than by steam for safety reasons. A visit to Reg Godde’s farm became a must do activity during the 1980’s where he had set up his display in a shed on his farm. In 1988, as part of the Nations Bi-Centennial celebrations, Reg was invited to take his display on a national tour. 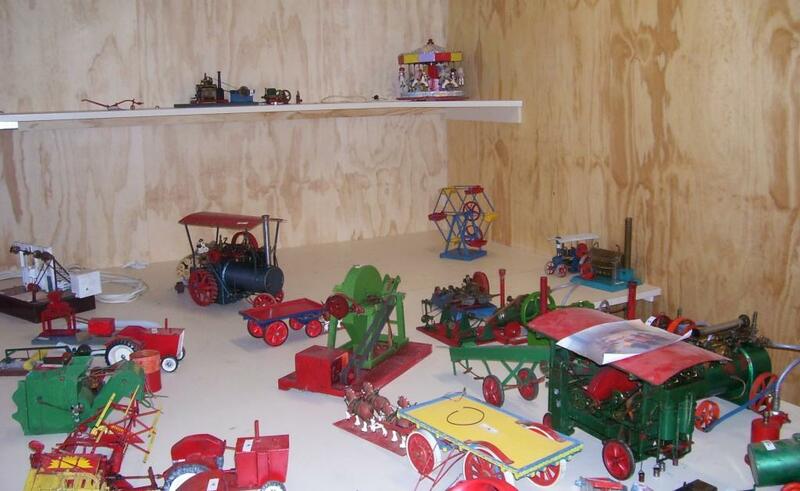 Many more people were able to view the models at the Coolamon Show where Reg would setup his display each year. The intricacy of construction of the models is considerable and an amazing example of the mechanical skills of Reg Godde. Designed and built to serve the people of the Coolamon district, the Up to Date Store resonates with the memories of the community. The Store was divided into several different departments which included grocery, ironmongery, crockery, drapery, mercery, millinery, haberdashery, clothing and footwear. In fact, it is true that anything and everything, from a plough to a piano could be purchased from the Up-To-Date Store. Today, the Up to Date Store is the focal point of a cultural precinct housing numerous collections which highlight the rural heritage of the Coolamon Shire. The Store boasts its original fittings including the Lamson Cash Railway, which is the only known Ball Style Cash Railway System in the world that is still in its original location. The Ball Style Cash Railway is the predecessor to the later models of cash carriers including the spring loaded ‘flying fox’ and the pneumatic systems that can still be found in department stores, today. The Store remains as a visual reminder of the ingenuity and skill of local architects, builders and the retail traders and their staff. It also remains as a focus for the collective memories of the people who, over the years, have called Coolamon ‘home’. The Up to Date Store’s social and historical significance was acknowledged with its listing on the State Heritage Register in 2006.